I'm visiting my mom again, and so I'm once again pawing through her fragrance collection, most of which I gave her over the years, an armload of full-sized bottles plus countless miniatures and samples. She has dozens of tiny bottles stored away in a box, a time machine from the late eighties and early nineties, and sitting on her vanity is the squat little Middle Eastern object you see above: Chopard's dramatic fruity oriental, Cašmir. It probably bears repeating that scents get reformulated after a while on the market: since the scent was launched in 1991 and my mom's bottle is at least fifteen years old if not twenty, Cašmir has certainly been reformulated in the interim and might smell quite literally nothing like what I'm smelling as I write this. 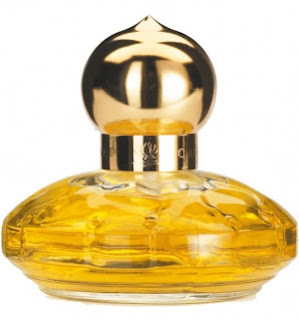 Cašmir (pronounced, as far as I know, "cashmere") opens strong and stays that way: it's a statement scent, and the statement is, "I am going to suffocate you, honey." Cašmir is a hot sweet mango-peach jam with a slosh of coconut milk and plenty of thick creamy vanilla: a bit of amber appears later on, but the main base note is more vanilla. It sounds like a Serge Lutens fruit-fest, but Cašmir has a quality that Lutens never does: vulgarity. It's a huge, brassy thing, no subtlety or nuance, just a sledgehammer wallop of scent. It doesn't smell cheap, exactly, but it does smell excessive: nouveau riche. It's likeable, but it wears out its welcome very quickly, and woe be to the wearer who applies more than a single spritz. but you shouldn't put too much stock in that. Whatever florals are supposedly in there are nominal, and whatever base notes might be present are mostly occluded by the vanilla amber. Cašmir is one of those fragrances with a large number of elements, twelve or twenty or fifty, arranged to smell like a single uniform thing with very little development, complexity masquerading as simplicity. Roses have historically been one of the most beloved of flowers: pretty much every culture that has ever encountered it has become devoted to its cultivation, and people worldwide just naturally find its scent beautiful, as if it were hard-wired into our brains. 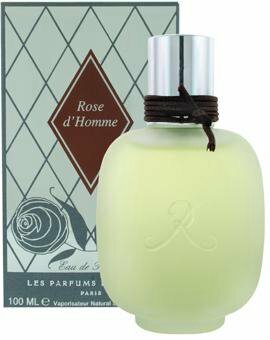 The rose is generally established in Western culture as a women's scent, but it makes an appearance in a great number of men's scents, though usually as a bit player and carefully disguised. The rose, heralded by a fresh citrus opening, is bright and dewy-wet with a soapy-clean undertone that shouldn't work but does. As the middle progresses, the brightness dims and the flowers take on a dried-rose quality which is even more attractive than the fresh roses; it feels comfortable, subdued, particularly when the leather emerges, smelling vaguely papery and vanillic like a roomful of leather-bound books. A little swipe of patchouli adds to the earthiness but doesn't overwhelm the leather. The bottle is the Parfums de Rosine house bottle, replacing the signature tassel with a leather cord. I don't know if that's enough to make the curvy, frosted bottle seem masculine: I don't care, but for some people a rose-heavy men's scent would have to be in the butchest, most aggressively manly bottle possible to take the curse off it. *If there's a men's tobacco/rose scent, I 'd like to know about it, because I suspect that those two things could smell fantastic together. I've never found one: maybe it can't be done, or maybe it was done and didn't sell. Basenotes lists fifty scents that contain both tobacco and rose, but I'm looking for something that is completely dominated by those two notes, with everything else just being support players or window-dressing. 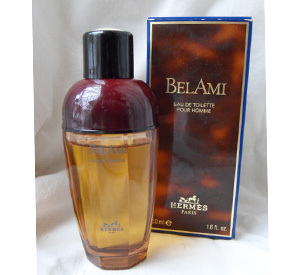 The original bottle for Hermes' Bel Ami, launched in 1986, looked like a tortoiseshell cocktail shaker, and how unbelievably cool is that? Even the box was tortoiseshell. Now it's packaged in the house bottle, which is nice enough, I guess, but since they put just about everything in that same bottle, it's kind of boring. Even the box has been boringized (although I approve of the brown-with-blue-accents colour scheme). As for the reformulated scent, I have no idea what it smells like, because I haven't been able to bring myself to try it, but by all accounts it isn't what it used to be. Of course it isn't: reformulation never improves a scent, but either dumbs it down by removing elements deemed by European bureaucrats to be too dangerous for human consumption (oakmoss might give .016% of the population an allergic reaction! ), changes it drastically to conform to modern tastes, or markets an entirely different, unrelated scent under the same name (an activity which should be illegal under bait-and-switch laws). But the original? It's so excellent that I couldn't understand or appreciate it when I first encountered it (not the first time that ever happened to me). 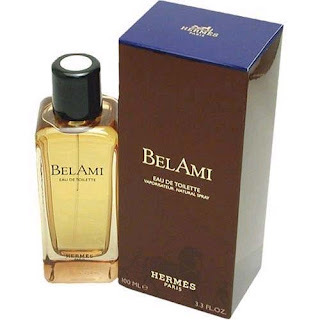 I got a typically big, generous sample (Hermes knows how to do them right) from the local perfumery, and I have a vivid memory of walking past the university library sniffing my wrist and trying to figure out if I liked or hated Bel Ami. And I couldn't decide. It was baffling, a complete mystery to me. I used up the entire sample and still didn't know. It was equal parts attractive and repellant, and in the end the essential strangeness of it kept pushing me away. I got another sample, emptied that, and still couldn't make up my mind. I didn't buy it. But it stuck in my head. Finally, last year, a quarter of a century later (! ), I ordered a big decant from The Perfumed Court, and at long last I was ready for it: I had smelled so many men's scents in the interim that not much could surprise me and nothing could scare me. It opens huge and mean, a gust of herbs and lemon, bitter pith and all, with a heavy-handed dash of Angostura bitters. And then, except for a long-lasting trail of bitterness, it's all replaced by an intensely complex leather: soft and cushiony, dirty-animalic, slightly floral with a hint of sweetness and (I think) the sharpness of vetiver, on a base of sandalwood and oakmoss. It is absolutely, uncompromisingly masculine and fantastically well done. If you go out and buy the current Bel Ami, I don't know what you'll get. (It can't be as good the original.) But if you should stumble across that vintage bottle, or if you just trust me and order some from TPC before they run out, then you are in for a treat, because oh, they do not make them like this any more. Perhaps it's unfair of me or perhaps I am missing some really terrific scents, but I avoid scents that are labelled "Sport" or "Aqua", because I know that they will bore me insensible. They're all the same! The ad copy may babble on about passion, vitality, excitement, a zest for living, but the scents are going to be poured from the same damned tank of citrus, vetiver, spices, and woods (and Calone, if it's an Aqua), most of it synthetic and all of it done to death. There are hundreds and hundreds of these things on the market, and there is nothing to distinguish one from another: they're like rack after rack of blue jeans — standardized, uniform, unadventurous. Consequently, I did not have particularly high hopes for Dior Homme Sport, and my expectations were fulfilled. Citrus, ginger, cedar, nothing new at all, nothing of the slightest interest, nothing that hasn't been done a hundred times already, of value only if you are determined to have the Dior name on your dresser or if you have never smelled a men's sport scent before and have nothing to compare this to. It might make a decent gift for a young man, because it's a step up from the body sprays they all seem to be wearing these days, but a very small step (and at ten times the cost, not worth it, either). 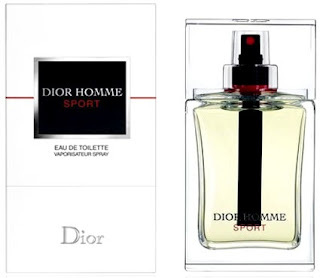 Dior Homme Sport is a flanker to Dior Homme, and like most flankers it has nothing to do with the original scent: it's just capitalizing on the established name and the look. The bottle, at least, is still excellent, the same glass monolith as Dior Homme, except that the spike is black and they've added a shot of red to the cap and the insignia. Wearers have to get their excitement somewhere. I had read that Dior Homme was based on iris, so naturally I had no interest in it: the iris and I do not get along very well. Since I had a miniature of it, though (I had bought a set of minis at Gatwick Airport a couple of years ago), it was inevitable that I was going to try the stuff sooner or later. When I finally did, I was blown away. 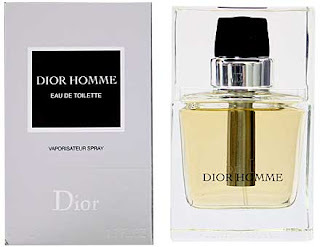 Dior Homme starts out the way most scents would be happy to end up: rich, warm, spicy, luscious. There's a hint of freshness and another of lavender, but mostly it's warm and masculine, expensive-smelling and extraordinarily good. I love it for about ten minutes. Then I start to get sick of it: isn't it getting a little too sweet, too thick? What's that cloying note that just appeared? That, it turns out, is the iris creeping in, and when it arrives, it's game over for me, because the iris dominates everything. There's literally nothing but iris in the middle, and it's kind of horrifying. There's probably an end in sight — there must be base notes of some sort — but I will never know, because I don't last that long: I have to get it off my skin before they ever show. The bottle, at least, is splendid, a massive, imposing block of glass stabbed through the heart with a silver tube. As I seem to have to keep saying in the name of fairness whenever irises raise their bearded heads: if you like iris, then you will probably like this, but keep it well away from me, please. If you pursue any art form long enough, perhaps you are destined to have this experience: it can't just be me, surely. You will find some exemplar of the form that you don't understand — that you viscerally hate, in fact. Not only do you not get it, you don't see how anybody else can, either: you don't even understand how the thing could have been made in the first place. Perhaps it even becomes a sort of outer limit for how far your love of the art form can extend. And the years go by and you've explored more and more of the art form, and then one day you re-encounter the thing, and suddenly the scales drop from your eyes and you get it, and more than that: you love it. When I began listening to opera in the mid-1980s, I hit my brick wall in the form of Richard Strauss, on a CD called Beverly Sills Sings Mozart and Strauss. Side B, the Strauss, was completely different from the tuneful, beautiful music I had been listening to up to that point. It was horrible to me: shapeless, formless, meaningless. I remember that I was actually angry that I could not find any meaning in it. And I listened to ever more opera, eventually stumbling across such modernities as Berg's "Lulu" and Hindemith's "Mathis der Maler" and Tippett's "The Knot Garden", which slowly opened my eyes to the possibilities of music beyond mere beauty, and one day — I don't remember when, exactly — I listened to Sills singing Strauss's "Amor" again, and suddenly it all snapped into place: compared to the structure of an aria, it is shapeless in its way, but its shapelessness has a purpose, and I got it, the giddy, skittering evocation of Cupid's playfully fluttering wings. And now a Strauss opera, "Salome", is one of my two favourites (the other is Donizetti's "Lucia di Lammermoor", the first one I ever listened to front to back and absolutely unmatched for tunefulness, almost the polar opposite of Salome). Your tastes can change over time as you become more educated: you're not going to love everything (I still don't really get Hindemith), but you're going to be open to more possibilities. 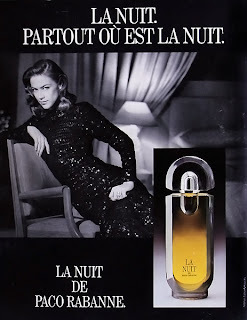 Which is exactly what happened with Paco Rabanne's La Nuit. I still remember, vividly, the first time I smelled it in 1985. I was sniffing literally every new scent that I could find, and that fascinatingly mechanical-looking bottle, almost a prototype for a vehicle from the future and (as it turns out) very Rabanne, was like a magnet. And I sprayed it, and took a sniff, and snapped my head back with a revulsion that I can still feel in my neck. What was this filth? How could anyone call it a perfume? How could it be manufactured and sold and worn? And for years it remained the outer limit for how awful a perfume could be. Unlike the Strauss revelation, I do remember when I tried it again: a month ago. A while back I ordered from The Perfumed Court a sampler set of rose fragrances for men, and there was the hated La Nuit. I ignored it, of course. And then one day I was reading a fragrance blog and it was mentioned, and I remembered that I had a sample of it, and I figured, oh, what the hell, you've got some, you might as well try it for old time's sake. I wasn't wrong when I hated it at first: like the Strauss arias, it was well outside the boundaries of what beauty meant to me. But if your tastes don't change and broaden at all as you get older, then you're stagnating, and you're missing a lot that could make you happy. I couldn't have understood La Nuit without first having understood Tabu, which I could not have understood without years of smelling orientals and chypres and gradually acclimating myself to the idea that art is not just about beauty but also about expression, whatever form that expression takes.